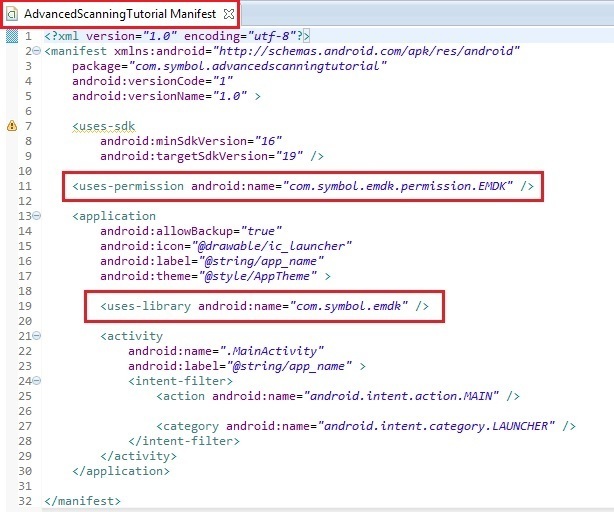 This guide will walk you through creating an EMDK For Android application that will use Barcode/Scanning APIs introduced in EMDK V 3.0, to perform some of the additional options along with Scanning operations on your Symbol Android devices without using Profile Wizard. The API uses Barcode Manager, which is the primary object to access barcode scanning feature. In this tutorial, we will explore the Barcode/Scanning API by using some of its features for developing an advanced application that will scan barcodes. The application focuses on scanning the barcodes using soft scan trigger, which would be a button that we are going to use in the application itself and not the hard scan trigger on the device. Reader Params: Reader params are used to configure reader specific options of a particular scanning device. In this tutorial, we will configure Illumination Mode for "Camera Scanner". Note: "Illumination Mode" is available only for Camera Scanner device. Vibration: This Scan Param is used to configure Vibration of the scanner device when scanning barcodes. 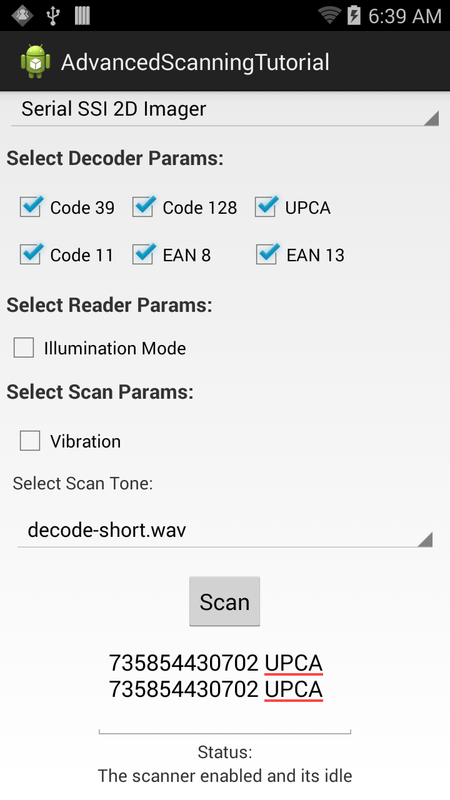 Scan Tone: This Scan Param is used to set Scan tone while scanning barcodes. We can apply various media, notification or alarm tones to the device while scanning barcodes. We can also keep a silent tone by not passing any parameter to this attribute. In this tutorial, we will provide a list of Scan Tones for the user to select including silent mode where we won't pass any parameter to Scan Tone attribute. 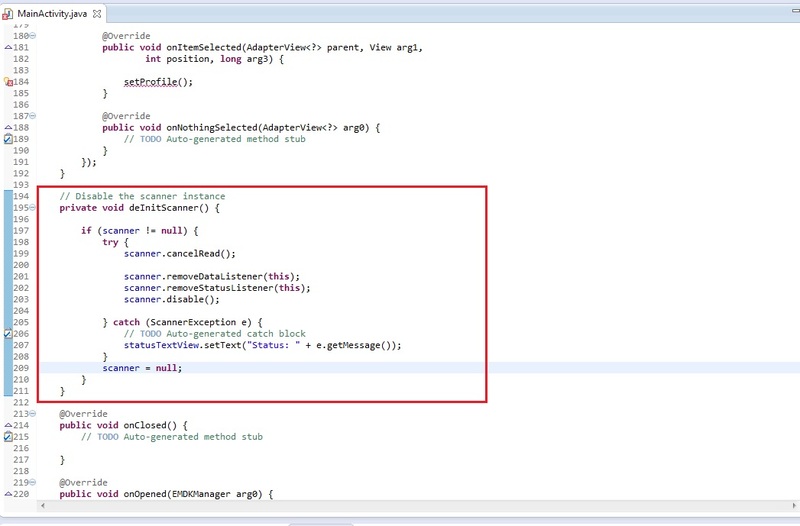 Note: Provide "AdvancedScanningTutorial" as the project name for this tutorial. 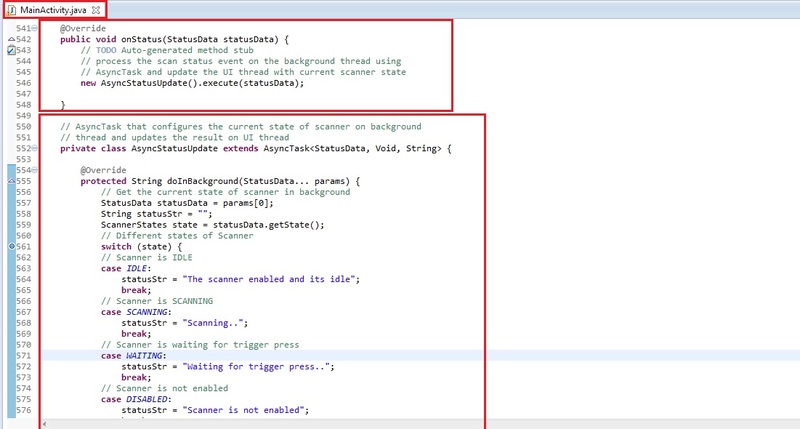 Implement DataListener for notifying client applications when the scan data is available. 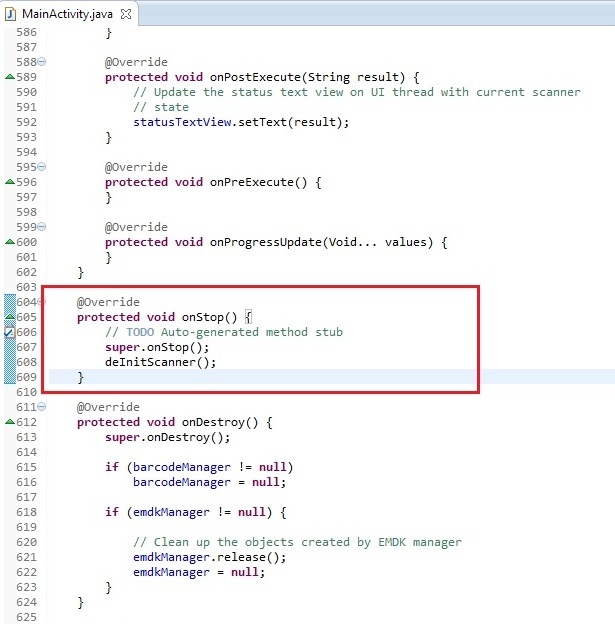 Override its onData function. 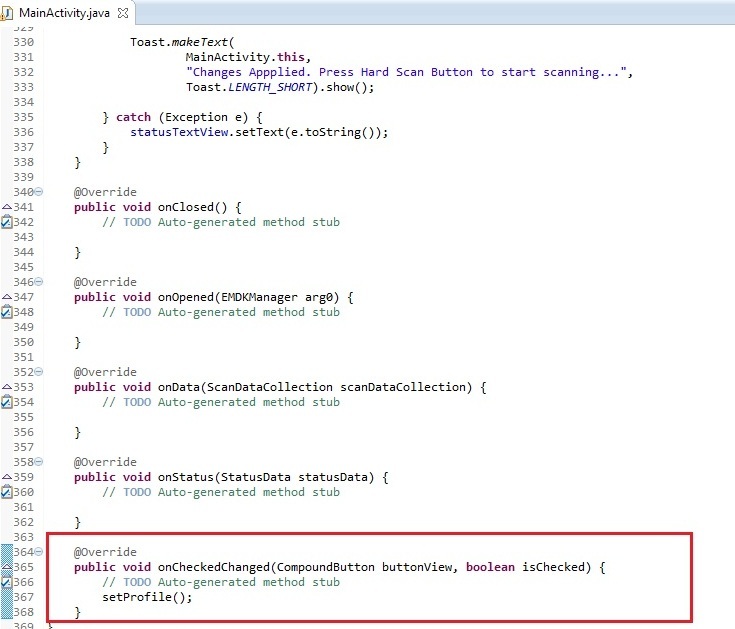 Finally, we will implement OnCheckedChangeListener that has an overriden method onCheckedChanged, which gets called whenever the user checks or unchecks any checkbox. We will be using checkboxes for various decoders that user can check or uncheck based on the requirement. 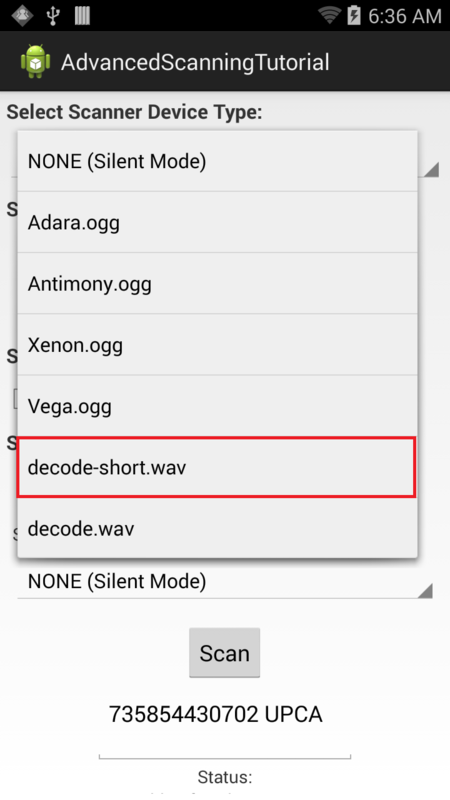 Note: To organize imports in Android Studio, press CTRL+ALT+O or CMD+ALT+O. We will also declare a boolean variable to call setProfile() method only when required avoiding scanner exceptions while setting profile. Note: Due to more variables, it has been divided into multiple screen captures. Now, let us design the simple UI that has fields for each of the features mentioned above starting with Spinner to display list of scanner devices and scan tones at the bottom. It will then have some Checkboxes to display decoder params, reader params and scan params for scanner. We then have a Button that would be set as a soft trigger in the app to scan barcodes later in this tutorial as we are not using the hard scan trigger of the device. Finally the screen has a TextView to display the status of scanning operation and above that an EditText to populate scanned barcode data. Since the UI has lots of elements, we need to embed it in a ScrollView to view all the UI elements. In the onCreate method, we take reference of UI elements that are declared in res/layout/activity_main.xml in order to use them in our Activity. We would then set OnCheckedChangeListener for all the checkboxes followed by setOnTouchListener for the "Scan" button that we have declared in UI. We will also set the Spinner Adapter to hold the list of Scanner devices and Scan Tones followed by the listener calls for both spinners. 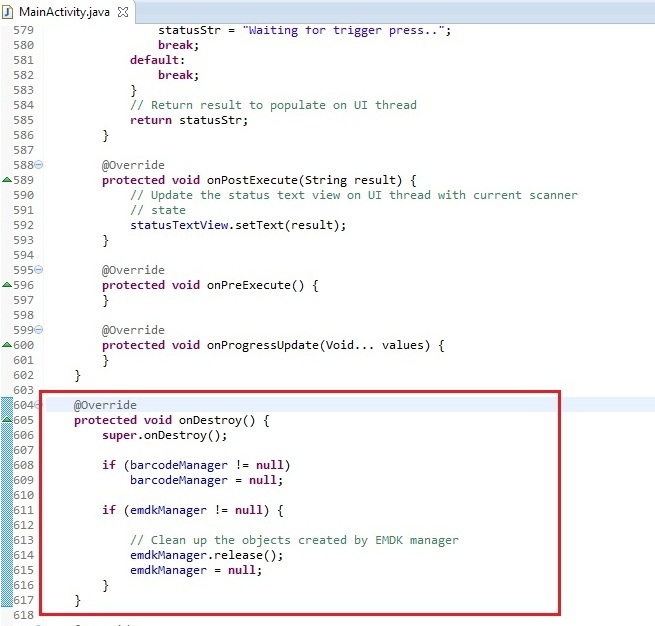 We then call getEMDKManager so that the EMDK can be initialized and checked to see if it is ready. You will see some errors, which we need to get rid of. So first, we need to provide scan_tone_array to the spinner data adapter. So create arrays.xml file under res/values folder and write following code of array in <resources> tag. This will remove the adapter error. Next, We need to add listeners for Scanner Devices and Scan Tone spinners. 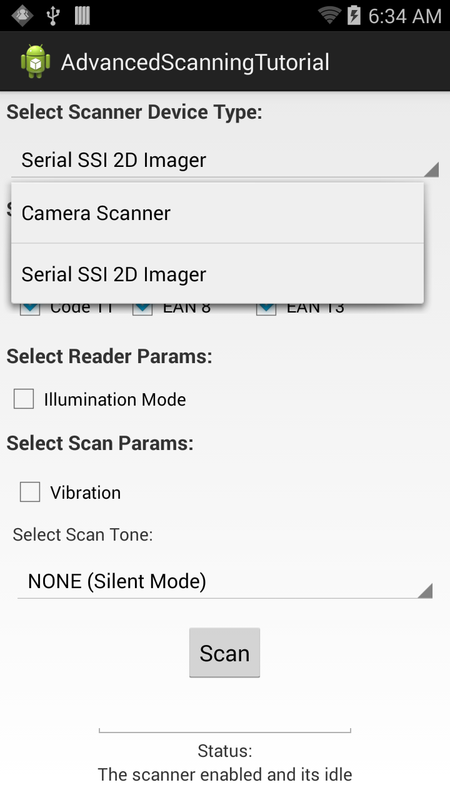 The listener for scanner devices spinner will disable the scanner if there is any using deInitScanner method and create new scanner instance of scanner device selected from this spinner with the help of index stored in scannerIndex using initializeScanner method. It will then call setProfile method which will set whatever the parameters are enabled in the User interface for various features. Note: We need to re-initialize the scanner and set the properties as we change the device type. The listener for scan tone will simply call setProfile method, which will set the parameters selected by user on the User Interface. Note: For scan tone spinner listener, we don't need to re-initialize scanner as we are not changing scanner device. Note: The purpose of isScanToneFirstTime boolean is to simply avoid calling setProfile again in the scan tone spinner initially, as it has already been set in the device spinner. We will now add the setOnTouchListener for Scan button. The purpose behind this is to scan barcodes by calling read method when user presses the Scan button and stop scanning by canceling any pending asynchronous read calls using cancelRead method when user releases the Scan button. The read method will not turn ON the scanner. It will, however, put the scanner in a state in which the scanner can be turned ON either by pressing a hardware trigger or can be turned ON automatically. This is determined by the Scanner.TriggerType. In order to scan barcodes using button through our application, we need to set the trigger type to TriggerType.SOFT_ONCE where the scan beam will come up automatically without having to press the hard scan trigger on the device after issuing the read call. 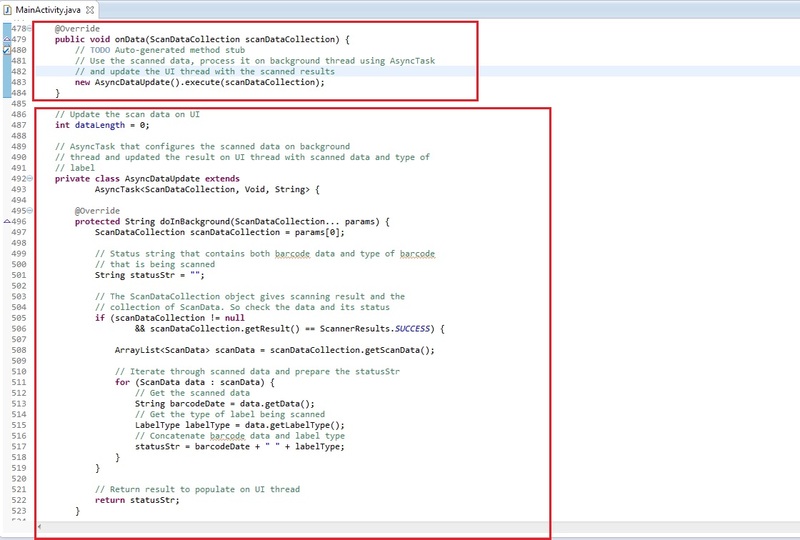 It will still show few errors as we have not specified the required methods yet. So first we will add deInitScanner() method that cancels any pending read operations, removes all status and data listeners, disables the existing scanner instance and sets the scanner instance to NULL. Next, we will write a method initializeScanner to initialize and enable the scanner and its listeners such as status, data etc. by using Barcode Manager object. The enable method enables the scanner hardware. This method does not make the scanner to scan or turn on the laser. Basically it will make the scanner device available for your application. If the same of scanner is enabled by other applications, this will throws ScannerExceptions. You must call disable() when you are done the scanning, otherwise it will remain locked and be unavailable to other applications. In case of any errors, the statusTextView will display a failure message to notify user. Now, we will add setProfile method. This method will create an instance of ScannerConfig, which will allow us to modify scanner properties (Ex. Decoder Params, Reader Params, Scan Params etc.) and set the changes back to the scanner instance. Here, we will read the checkboxes and spinner values and set them accordingly to the scanner instance through ScannerConfig. config is name of ScannerConfig instance. 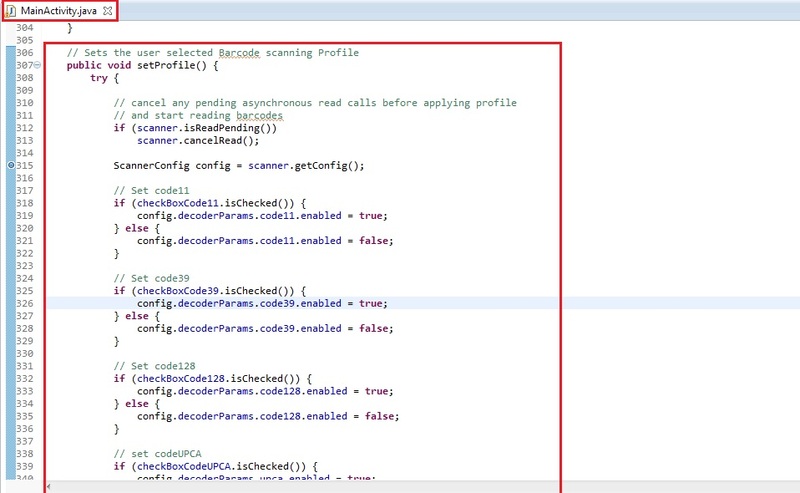 Initially we will cancel any pending asynchronous read calls before applying profile and reading barcodes using cancelRead method on the scanner instance. config.decoderParams allows us to set all the decoder params such as code11,code39 etc. readerParams.readerSpecific.cameraSpecific.illuminationMode enables user to set Illumination Mode, which is available only for CameraSpecific devices. 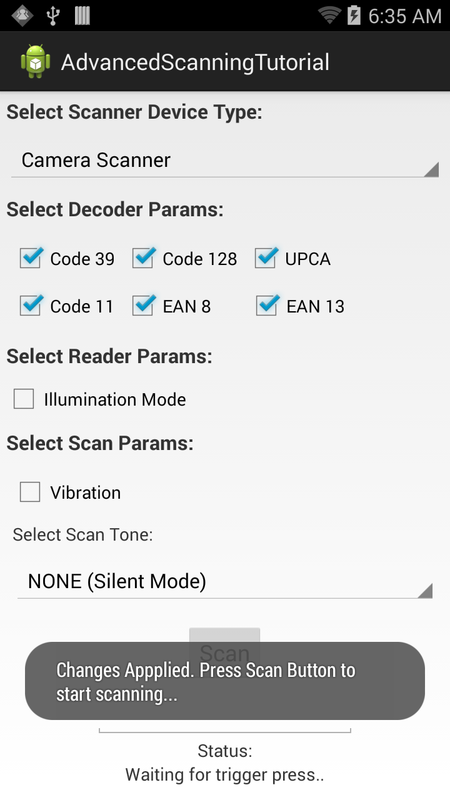 config.scanParams.decodehapticfeedback lets you set Vibration Mode of the scanning device. 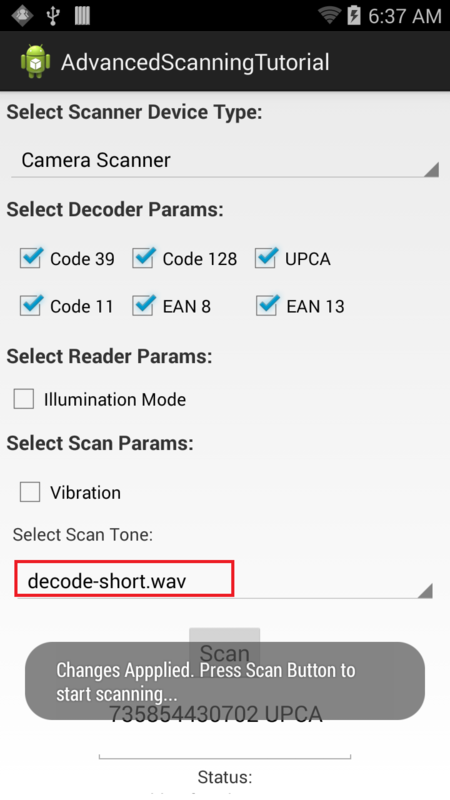 config.scanParams.decodeAudioFeedbackUri will accept a URI for the Audio Tone that user needs to set while scanning a barcode. Note: An empty URI (Ex. 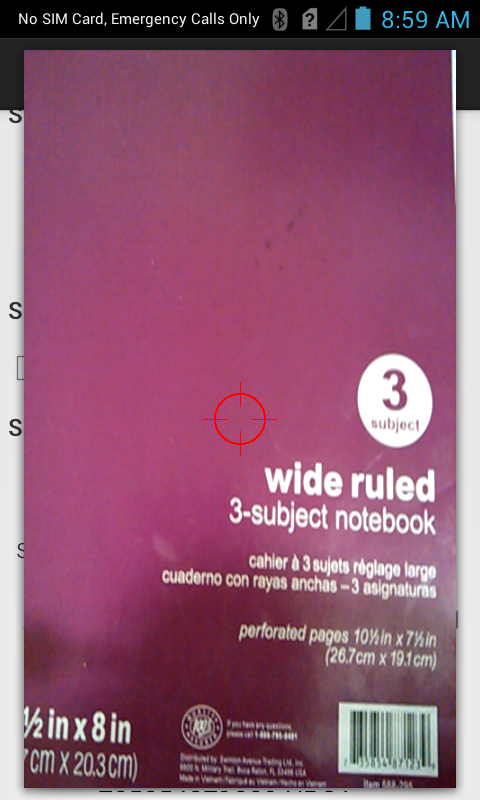 config.scanParams.decodeAudioFeedbackUri = "";) indicates that there will not be any scan tone while scanning a barcode. In other words, it would be your silent mode. Whenever the user checks or unchecks any checkbox, we update the settings to the scanner instance at runtime by calling setProfile() method through onCheckedChanged method of the OnCheckedChangeListener that we implemented earlier. So add the method call in onCheckedChanged() method. Now we need to use the onOpened method to get a reference to the EMDKManager. The EMDKListener interface will trigger this event when the EMDK is ready to be used. The EMDKListener interface must be implemented in order to get a reference to the EMDKManager APIs. This event will pass the EMDKManager instance and we assign it to the global variable emdkManager that we created in the earlier steps. We have used that instance to get an instance of Barcode Manager to enable scanning. 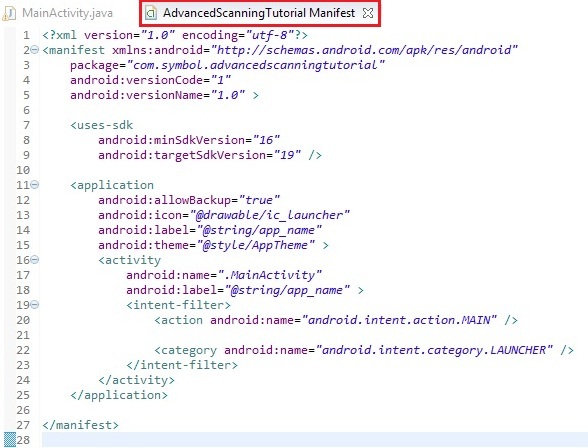 Once that is done, we need to get all the scanner devices that a Symbol Android device supports with the default one selected first using enumerateScannerDevices() that we will declare in the next step. We are not calling initializeScanner() and setProfile methods here as we have already called them in the device selection spinner listener. 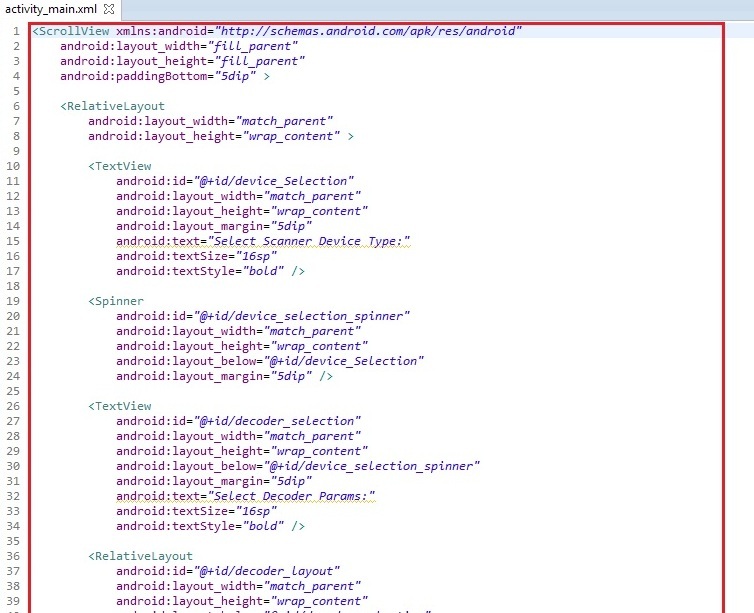 To get rid of error, we will create enumerateScannerDevices that will get all the scanner devices that a Symbol Android device supports with the default one selected first. It uses getSupportedDevicesInfo method on barcodeManager instance that returns a list of supported scanner devices for that particular Symbol device. We will then iterate through this list, get the friendly names of each scanner device and add them to our list with those names to show user in Device Spinner. When we are done with scanning, we must release the scanner hardware resources for other applications to use. 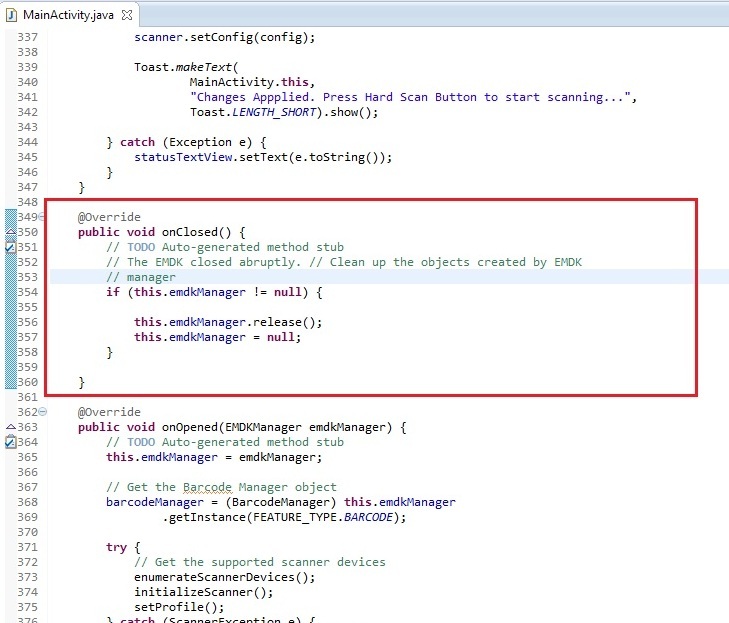 So override onStop method and disable the scanner by calling deInitScanner method to release it. That's it!!! 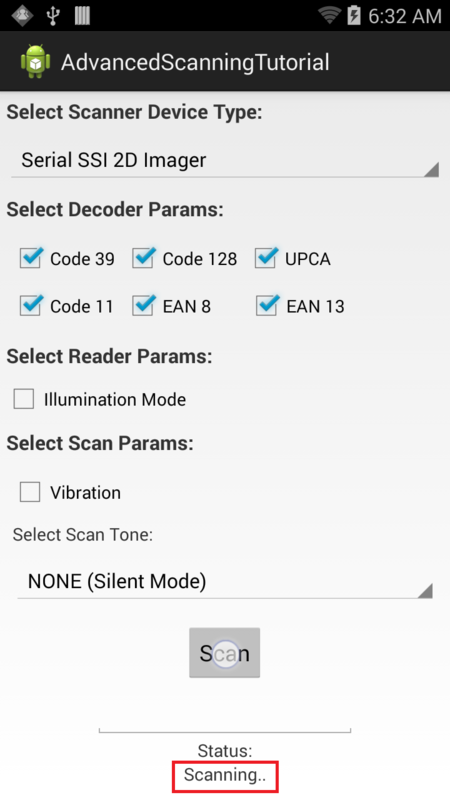 We are done with all the coding part that will let us perform some advanced barcode scanning operations on our Symbol Android device using Barcode/Scanning APIs introduced in EMDK V 3.0. Now let us run the application. 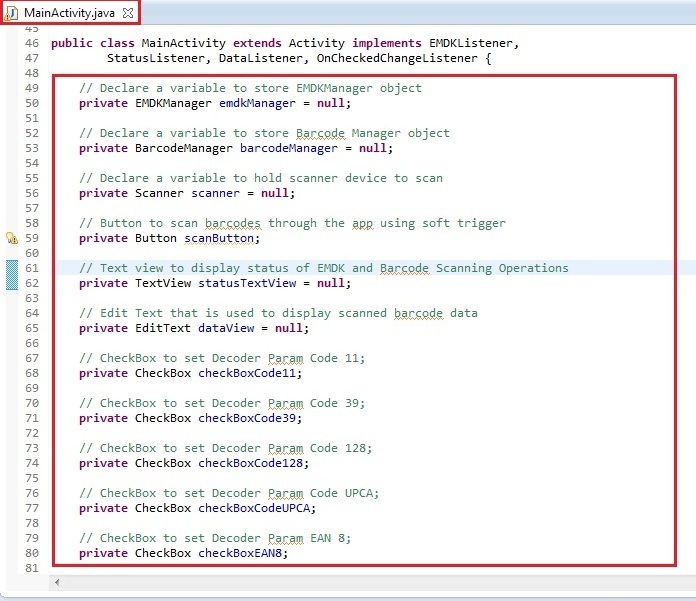 Now if you press and hold the Scan button on the UI, the status listener in the code starts working and current status of Scanner is displayed in Status TextView, which is Scanning. The "Scanner Device Type" Spinner shows Serial SSI Scanner as it is the default scanner for Symbol TC55 device. All the decoders are checked, which means current configuration scan supports all of these decoder types. But Scan Tone is NONE, which means there won't be any tone/sound while scanning a barcode. The scanner status is always updated on the status text view below the Edit Text at the bottom. Lets us change some configurations starting with the device type. We will change it to Camera Scanner. It will display a success toast when the changes are applied each time you change any scanner configuration just for your knowledge. Next check the Vibration checkbox and select some scan tone from the Select Scan Tone spinner. Now once again scan a barcode and this time it will open your device's camera to scan the barcode. This is how Barcode/Scanning APIs introduced in EMDK V 3.0 can be used to perform some of the Advanced Scanning operations using soft scan key through application on your Symbol devices without using Profile Wizard.